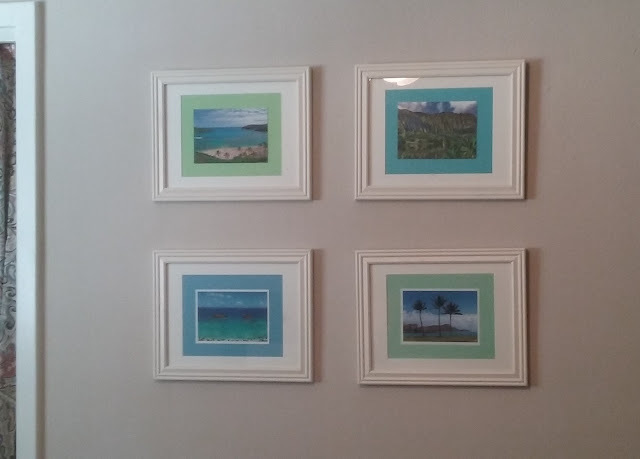 I knew I wanted a beach theme in our guest bedroom in Florida, so I scoured Pinterest for ideas. I knew I wanted a lot of different pillows on the bed that had beach theme. 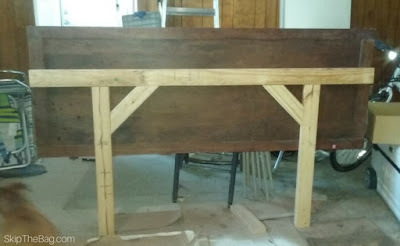 Years ago Hubby made a bed frame for our guest bed, but we never had a headboard. As I was looking for ideas for the room and different kinds of headboards I saw several tutorials discussing headboards made from old doors. I showed Hubby the idea and we were off to look at old doors! We first went to a local antique/resale shop. They had the perfect door I wanted, It was white, aged, and had a symetrical design along the entire door. Unfortunately the door was slated to be turned into a table so the guy wouldn't sell it. There was another door there, but they wanted $90 for it and I just didn't like it as much. So we went to the Habitat for Humanity ReStore next. For those of you who don't know Habitat for Humanity is a non-profit that builds houses. Their ReStores sell used building supplies and housing parts to help fund their builds. Seriously, they have tons of stuff! Sometimes they don't have anything of interest, but they are always getting new stock . They have cabinets, doors, lighting and bath fixtures, couches, paintings, paint and more. I could tell there was a local hotel that must have just gone through a renovation and donated the old items because there were nearly 30 identical light fixtures and paintings. We went to their door section and they had a huge selection. There weren't any exactly like what I was looking at the antique store, but there were several options. We ended up selected a solid door that probably was an old pantry door. It was $10! Hubby also picked up two 2x4 pieces of lumber from ReStore and we were ready for the project. We measured the height of the mattress and had the bottom of the headboard match up a couple inches below the mattress. We braced it with a piece across the back, and then attached it directly to the bed frame. 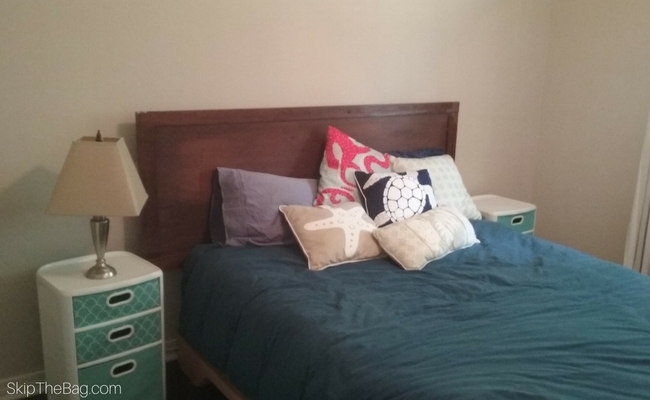 So I got a great, sustainable headboard for less than $20! I thought about painting it white, but I sort of like the color it adds. 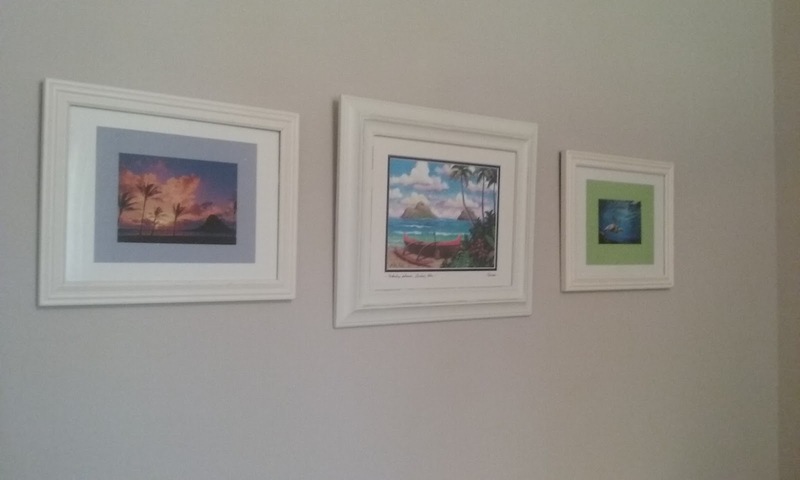 We also hung up some pictures/postcards I had gotten of our favorite spots from when we lived in Hawai'i. These frames have been with us a long time. We purchased them as black frames to hold black and white photos we took from our travels. Those pictures didn't really fit in this house so I spray painted them white and put our beach photos in them. We've got Hanauma Bay, the Ko'olau mountains, the Mokuluas (the Mokes) twice for good measure, Diamond Head, a swiming honu (turtle) and Chinamans' Hat. 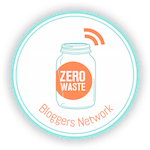 Looking for other DIY projects? 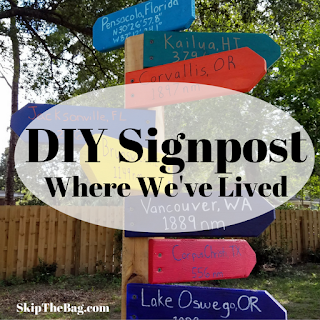 Check out the tribute we made to the places we've lived, but could easily be adapted for your favorite vacation spots. 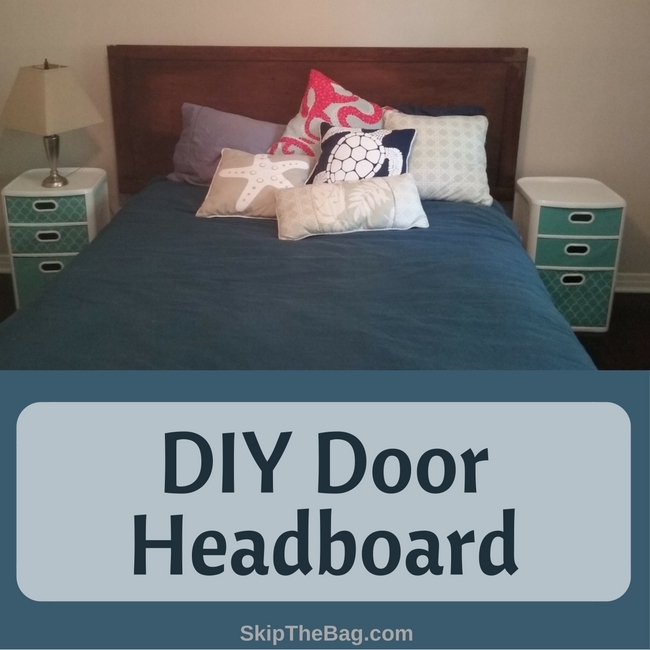 I would like to praise your idea of making headboards from old doors. For sure it's worth an appreciation. Awesome. I would have preferred a door with some more molding on it, but I couldn't argue with the price. And all the doors with molding on them formed frames which were unequal sizes so it would have looked funny on it's side. I always figured I could add molding, but haven't needed to yet.